Summer is here, hooray! 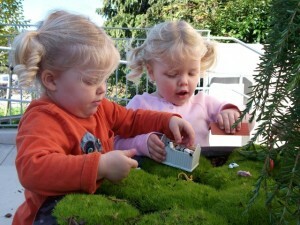 As the days warm up and dry out, my kids and I are thrilled to move more of our play outside. Here are five great activities to try with your tots that we enjoy, and hope you will too. Happy playing! Create a fairy garden or growing play pot: We found some examples of this at a visit to our local children’s playgarden and my girls loved it. You can go simple or more intricate with this, depending on your kid’s ages and your dedication to the project — both types are fun! Start by filling a large pot (ideally a good height for kid play) with potting soil and plant with some sturdy plants (tree-like, perhaps?) and moss or ground covers, the more soft and touchable, the better! I know nurseries around here carry ground covers touted to be “step-able” that would work great. You can add details like stones and pebbles, then some little animals, fairies, trucks and toys, and play and create to your hearts content! 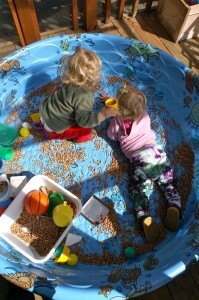 Take sensory play outside: We have a wading pool but some days (many!) in Seattle are just not great for water play. Why not dump in some beans, rice, balls, pillows, packing peanuts or toys (duplos, marbles & tubes, or a mix of colorful toys work well for us) and let the kids climb on in to play? FYI, You do not have to fill it all the way! Just a small layer on the bottom works fine for us, or a full dish tub set inside the pool, ready for dumping — the sensory experience of climbing right into the middle of it all is plenty for my kids. If your young toddler is mouthy you may have to watch closely or avoid certain small items, but most of the time they get it pretty quick. We do this both outside in the grass (not with small easy to lose things like marbles though!) or on the porch. This also works well for us on rainy or cooler summer days, too, we just drag the pool into the living room, and presto: instant playground! 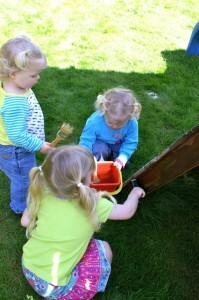 Paint rocks and decorate the garden: We love this because it has a number of steps, each fun on it’s own for my kids! This can be a multi-day project if you wish! Go on a rock walk in your neighborhood, at the park or beach, and pick out some large rounded river rocks or stones that you can take home. Wash and dry the rocks. My kids love this step! Makes sure they are dried well before…. Painting! Paint or color your rocks in some way. 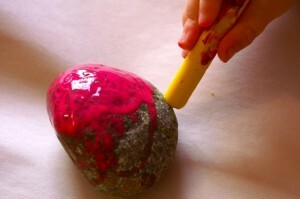 Our preferred method is “hot painted rocks“, where you heat up the rocks in the oven for a bit (225-300 degrees F), peel some crayons, and then melt melt melt away. Oh so fun (and pretty!) and fairly permanent, at least in our mild climate! We didn’t have any problems with burning fingers with my 3 and 5 year olds — they learned very quickly not to touch the warm rocks. Finally, find a nice windowsill, step or spot in the garden to display your rocks. Or a bucket or wagon in which to cart them endlessly around the yard….. Mix parts equal parts cornstarch and water (I actually made it slightly more watery than that, to stretch the paint a bit), adding as much food coloring as needed to make the colors bright. 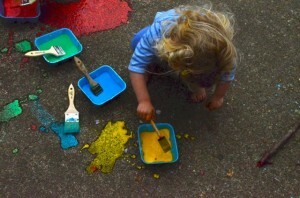 My kids loved stirring up the paint — but needed a bit of help to get it all stirred up well. We painted with brushes for awhile, then turned to drizzling and drip paintings. Fun! Some friends have asked me if it stains the sidewalk — it didn’t for us! It did take awhile for the cornstarch to wash fully away, but I was relying on nature and I bet a good scrubbing with the hose and possibly a broom or brush would have taken it off efficiently if needed. Our cement is not new and is very textured, so stains wouldn’t have shown up too much anyway. What other warm weather activities have you discovered or want to try? 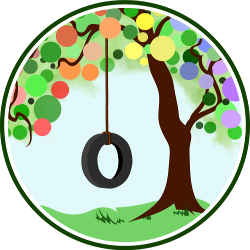 Check out the Natural Parent Network Pinterest boards for more fun ideas, as well! These ideas are just what I need right now. Thanks! We have done, and love painting with water, but have not tried any of the rest and I’m excited to change that!